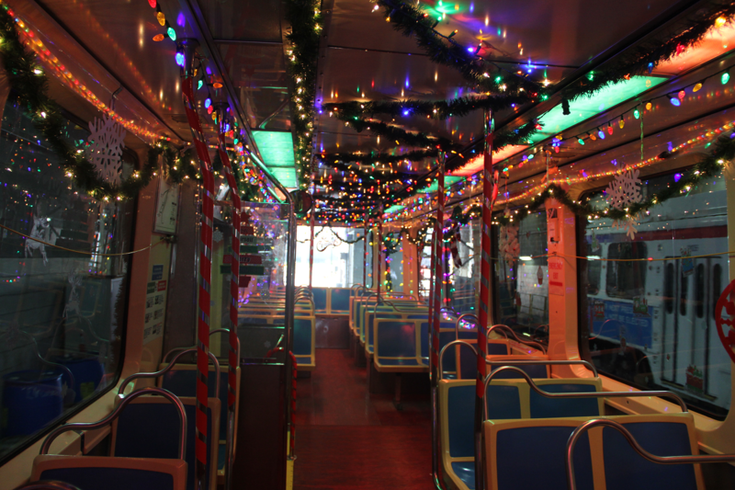 Some of SEPTA's trolleys have been decorated for the holiday season. It wouldn't be the holiday season without some tinsel in your face while you hold on for dear life in a packed trolley cart. SEPTA has brought back its "jolly trolleys" to join the already decorated Broad Street and Market-Frankford line trains, making the commute to and from work all the more festive. Trolley No. 2336 operated on Route 15; No. 9053 on route 10; and No. 9031 on routes 11 and 36 can now be ridden in style, complete with tinsel, bows and lights. Heather Redfern, a spokesperson with SEPTA, said the Route 11/36 trolley was decorated by operators Fred Garmon, David Musgrove and Musgrove's son last week. The group's been decorating their trolleys for about four years, Redfern said. The Route 10 and Route 15 trolleys, which passengers could catch adorned with festive ornaments Tuesday, have been decorated by operator Gary Mason. Mason's been stringing garland and hanging lights since 1993. The trolleys joined two Broad Street and Market-Frankford line subway trains that were decorated as part of the "Santa Express" – an event that brought Santa to Dilworth Park for a winter celebration on Nov. 25. Now decorated for the 26th year in a row, they'll stay festive until the end of the holiday season.